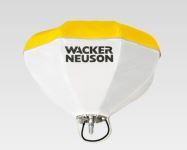 Wacker Neuson's light balloons feature a compact design providing optimal brightness without glare. Ideally suited for general job site illumination, road work, indoor/outdoor illumination of concrete pours and party rentals. 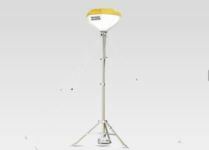 Light balloons feature rugged, simple construction allowing for use almost anywhere a reliable light source is needed. A powerful and portable package to light your job site! 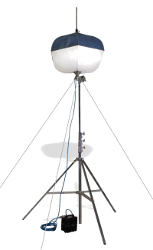 A simple, one-step mechanical balloon opening system eliminates noisy fans and balloon holds its shape even in wind or if fabric is torn. The balloon's heavy duty, translucent, white rip stop nylon allows diffused bright light from the metal halide lamp to be evenly distributed onto the work area for a consistent, reliable lighting solution. Reflective aluminum coated upper balloon made of tough kevlar fabric reflects light downward maximizing lumen output at ground level. Set up of the fully operational light balloon is quick and easy with minimal pieces and simple assembly. This compact package makes for easy storage and transport. LBA 1 provides a fully functional balloon (balloon, ballast and cables) without a tripod, ready to be attached to a customer supplied mounting system.